Fireworks season is here and operators are ready! 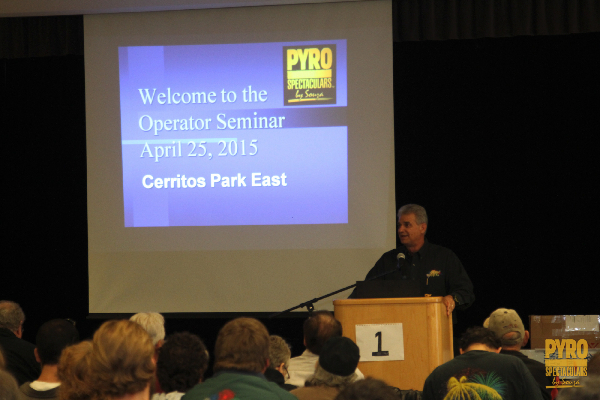 Pyro North and South hosted their annual operator seminars on February 28th and April 25th respectively. Operators from all over the state came together to learn new skills, reinforce existing skills and connect with the community. The seminars also included important regulatory and safety updates which informed the operators of the most recent acceptable company and industry policies. "I learned a lot today and appreciated the opportunity to connect with my peers and the community. I think it is wonderful how Pyro Spectaculars invests in the education and well-being of its operators. After today’s seminar I’m ready, excited and looking forward to July 4th." said licensed pyrotechnician Steve Yoss. As seasoned pyrotechnic professionals know, “the Season” (at least in the United States) starts ramping up as early as April 15, and continues all the way through the first week of July. 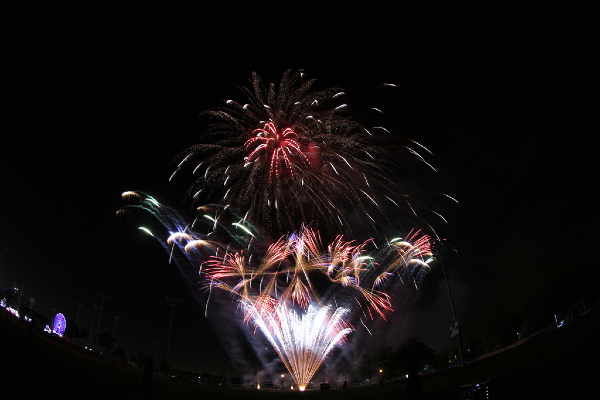 Licensed Pyrotechnicians look forward to the kick-off event… the Spring Seminars and Showcases… where all the latest and greatest fireworks plans are unveiled. The highlight for veteran operators is the annual Recognition Awards which celebrate Safety, Professionalism, Experience, and Service. Click here to read a list of all awardees. 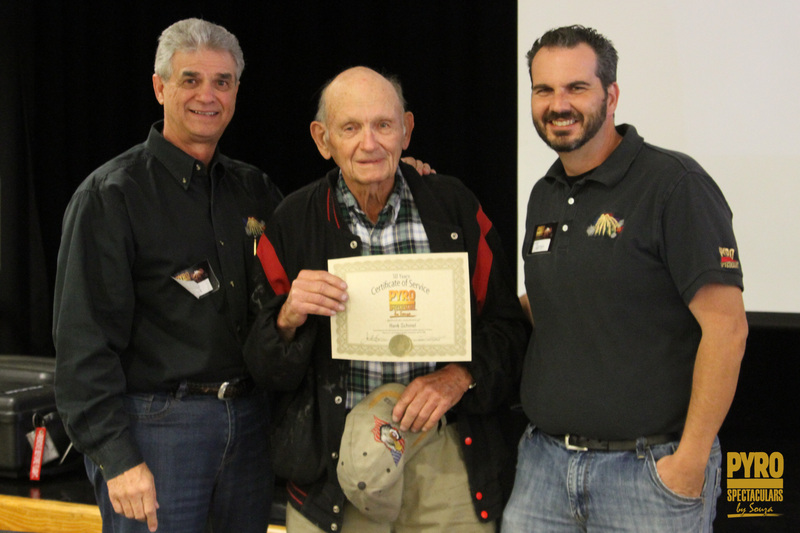 Prof. Robert Bronner presents David Wright with the Best Truck award for 2014. 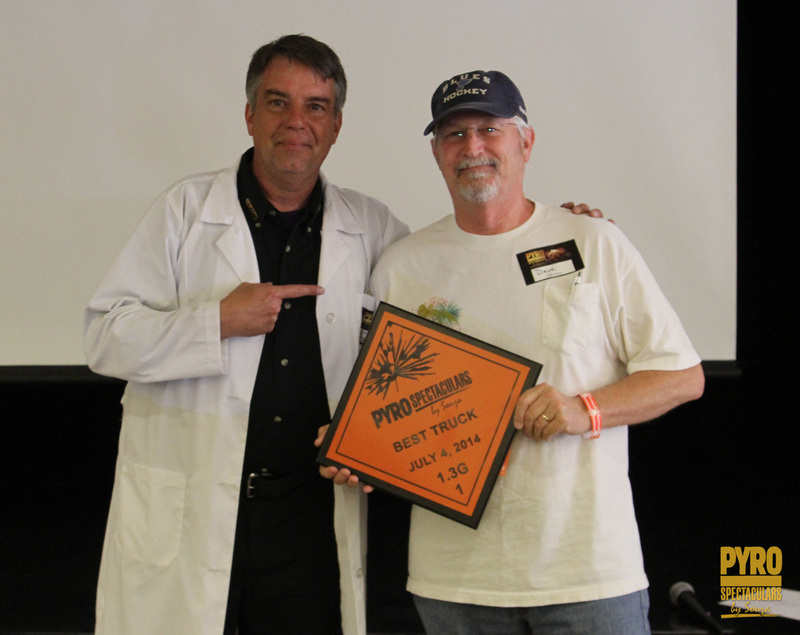 Thank you to Kurt Brubaker, Dorris Hennings, Robert Lotzgesell, George Pawluk, Christian Pieters, Henry Pinheiro, and Beckie Timohovich for your 15 years of service to Pyro Spectaculars. Pictured above are 5 of the more than 50 Licensed Operators recognized this year for significant milestones in their years of service to Pyro. From left to right are Jeff Thomas – Pyro North Show Producer, Ian Gilfillan – Pyro Spectaculars Executive Vice President, Eliot Leon – 5 years, Rick Dorantes – 5 years, Garrett Neckels – 5 years, Barry McClain – 5 years, Reuben Goldberg – 15 years, Jim Souza – Pyro Spectaculars President, Kevin Gilfillan – Pyro North Management Team. 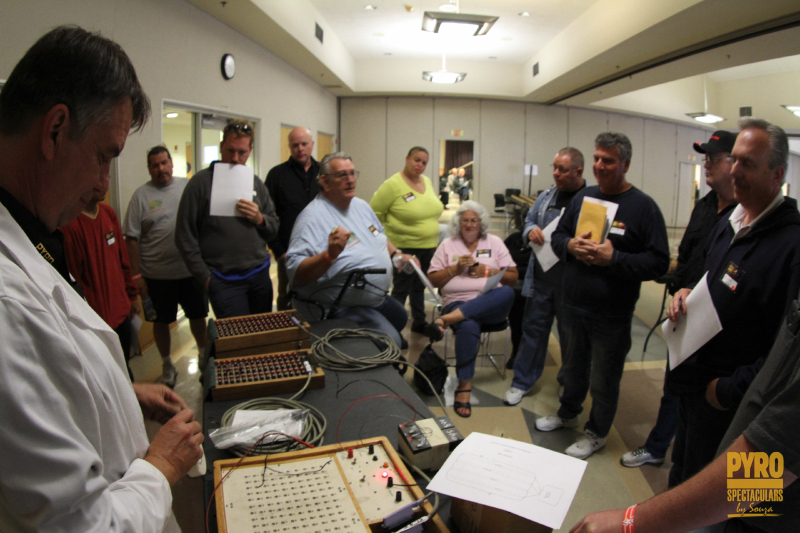 Photo taken at Pyro North Operator Training Seminar, Brentwood, CA on March 28, 2015. A big thank you to all the talented and dedicated Operators that keep us safe and successful. 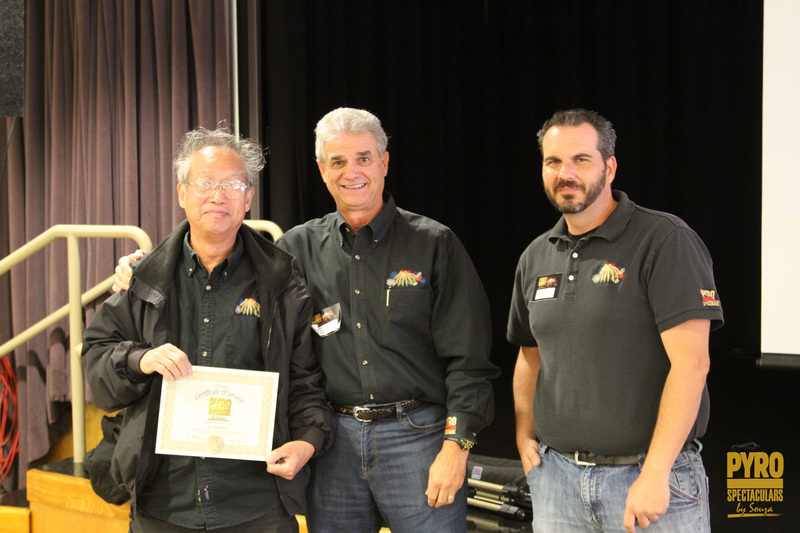 Recognition was given to operators in 5-year increments, ranging from 7 five-year veterans to this year’s most senior honoree, Hank Schmel… who was recognized for 50 years of professional pyrotechnic experience with the Pyro Spectaculars family! 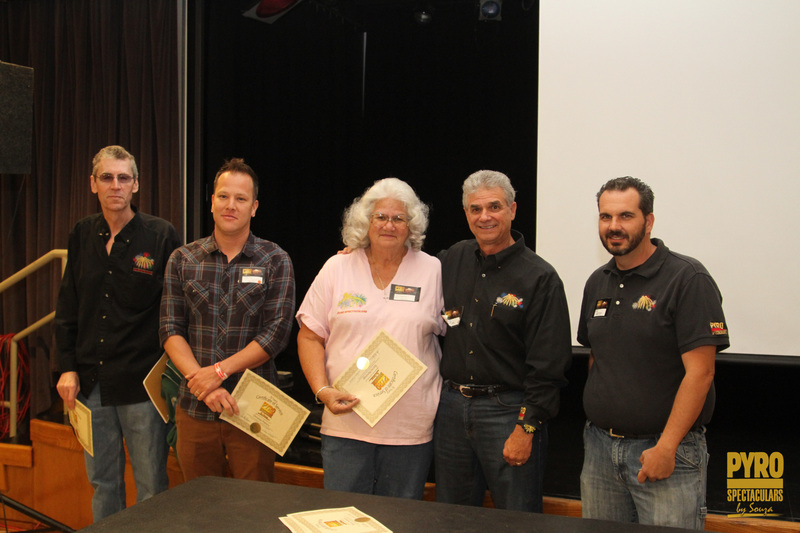 The combined service of all those receiving awards totaled 485 years! Both Schmel and 40-year honoree Ui Yung Kim (Mr. Kim) received standing ovations from their peers as they received their awards.